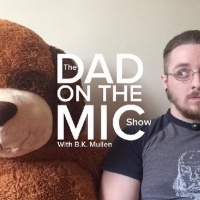 Ben Mullen is a writer, producer, blogger, and podcaster. He is the founder and CEO of Lazy Banana Productions, his own production company he founded in 2007. In August 2013 he and his wife Carissa were blessed with the arrival of their daughter Emmanuelle “Emma” Mullen. They currently live in the Philadelphia area. Ben’s primary project at the moment is Producing/hosting podcasts via the Lazy Banana Podcast Network. This includes “The Dad on The Mic Show”,”Geek-O-Clock” and “The Poppin’ Bottles Dad-Cast” as of February 2015. You can find all of his latest projects on this very site, as well as news and updates regarding future projects we’re all excited for this year including “Pops Garage”, “Dads in The Kitchen” and more! Want to contact Ben? It’s easy! Want to learn the ins-and-outs of podcasting? He is also available for speaking events!